• Manages the project timelines and approvals for marketing and communication deliverables at Dean Health Plan, including prioritizing daily workflow to ensure that personnel, project work & budget expenses are maximized. • Works closely with department leadership to evaluate incoming projects and determine project priorities and timelines. • Partners with Creative Services to present orderly requests and support timely delivery of projects and materials. • Administrates and leads DHP participation in the shared marketing work flow system. • Provides technical guidance to users for the shared marketing work flow system. 1. Manage project intake, workflow, trafficking and communication with clients and team members using the shared marketing work flow system and its templates. 2. Communicate delays and obstacles to key clients and team members. 3. Interface with Creative Services, agencies, Compliance and other partners. 4. Administrate the marketing work flow system. 5. Demonstrate exceptional project management skills. 6. Monitor team capacity and productivity, managing job logging, hours reporting and capacity/productivity reports. a. Offer daily trafficking dashboards for Marketing Specialist, Marketing Managers, Product Managers, Sales Managers and Directors. 7. Maintain strong working relationships with the sales, product and compliance teams, keeping them apprised of any issues or anomalies that impact business or operational units. 10. 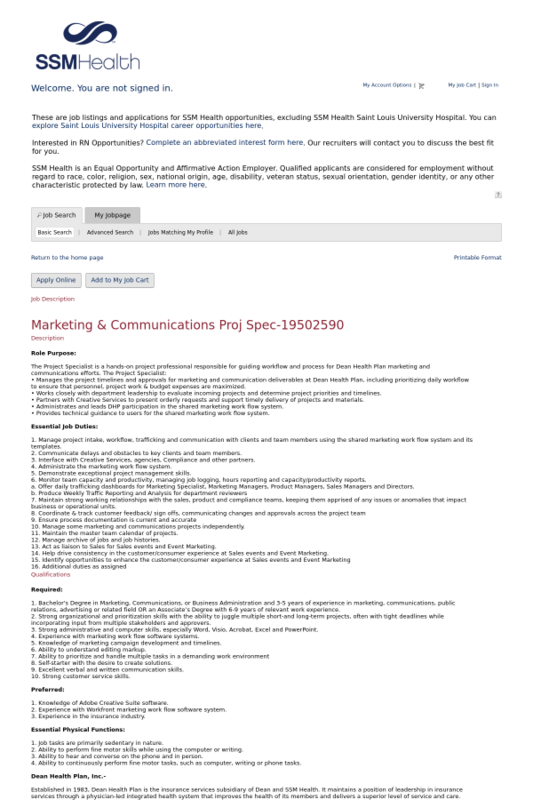 Manage some marketing and communications projects independently. 11. Maintain the master team calendar of projects. 12. Manage archive of jobs and job histories. 13. Act as liaison to Sales for Sales events and Event Marketing. 14. Help drive consistency in the customer/consumer experience at Sales events and Event Marketing. 1. Bachelor's Degree in Marketing, Communications, or Business Administration and 3-5 years of experience in marketing, communications, public relations, advertising or related field OR an Associate’s Degree with 6-9 years of relevant work experience. 2. Strong organizational and prioritization skills with the ability to juggle multiple short-and long-term projects, often with tight deadlines while incorporating input from multiple stakeholders and approvers. 3. Strong administrative and computer skills, especially Word, Visio, Acrobat, Excel and PowerPoint. 4. Experience with marketing work flow software systems. 5. Knowledge of marketing campaign development and timelines. 6. Ability to understand editing markup. 8. Self-starter with the desire to create solutions. 10. Strong customer service skills. 1. Knowledge of Adobe Creative Suite software. 2. Experience with Workfront marketing work flow software system. 3. Experience in the insurance industry. 2. Ability to perform fine motor skills while using the computer or writing. Confirmed 17 hours ago. Posted 29 days ago.